With a dominant 4-0 victory on Sunday, the Tampa Bay Lightning dispatched the New York Islanders and advanced to the Eastern Conference Final. The Game Five win marked Ben Bishop’s fifth career shutout in the Stanley Cup Playoffs. Tampa will play the winner of the Pittsburgh Penguins/Washington Capitals series, which finds the Penguins again three games to two with Game Six set for Tuesday. 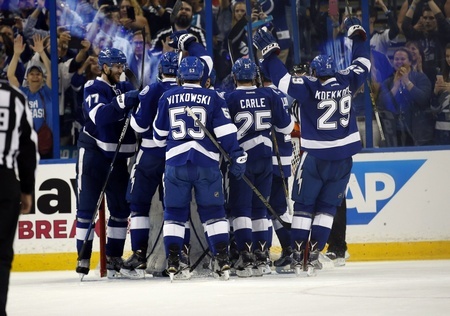 The Lightning, who are advancing to the conference final for the second straight season, have played some fantastic hockey and Sunday saw their dominance in full display. They’ve required just 10 games to reach the conference final, thereby eliminating a lot of the customary wear and tear of the post-season. And they’ve done so without Steven Stamkos and Anton Stralman, both of whom could potentially be ready for the Penguins or Capitals. Tampa got goals from Brian Boyle, Nikita Kucherov and Victor Hedman on Sunday, with the 25-year-old Swedish defenceman coming up with two markers. Hedman has nine points in 10 post-season games thus far and always looks dangerous. Kucherov scored his ninth goal of these playoffs and has 11 points in 10 games, cementing his place on the Lightning’s deadliest unit. As for Bishop, the 29-year-old from Denver posted his second shutout of the playoffs and has a 1.89 goals against average with a .938 save percentage. Jonathan Drouin’s emergence has also been a huge factor and he continues to show unreal composure. He has nine points in 10 games, including eight assists. As for the Islanders, their frustration is palpable. After finally winning a playoff series for the first time since 1993, this second round exit stings. John Tavares went without a point in the last four games and goalie Thomas Greiss wasn’t strong enough to hold back the storm. The 30-year-old exits with a 2.46 goals against average and a .923 save percentage. New York has a lot to be proud of, but they’ve also got a lot of work to do. With the likes of Matt Martin and Kyle Okposo coming up as unrestricted free agents and defenceman Travis Hamonic having requested a trade, the Islanders could be a whole new team come next season. And after this disappointing loss to the Lightning, that may be a good thing after all.